“Founded by brothers Graham and Ralph Parker and a cousin Henry Parker Brewer, Parker’s Barbecue has for years been one of the best known names serving Eastern North Carolina style barbecue. One of the reasons for this is that Parker’s originated in a town with tobacco markets. The tobacco company buyers, as they moved about their circuit, helped spread the word about the good barbecue they had encountered. Parker’s name and stories about their good barbecue soon spread about the coastal plain. Another reason for Parker’s popularity is its business site. Ask realtors what is important and they will say “location, location, location.” Well Parker’s has been in the right location since 1946. The barbecue is finely chopped by machine and seasoned in the kitchen with an Eastern North Carolina vinegar-base sauce. My preference is pulled barbecue that is more moist and in coarser pieces. 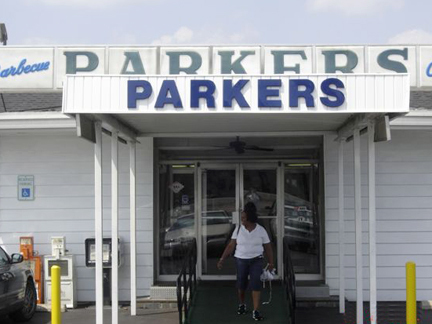 However Parker’s knows and understands its customers and gives them exactly what they want. And the faithful like it finely chopped or shredded, drier, leaner and lightly sauced. Parker’s cooks whole hogs. The mixture of the drier hams with the shoulders along with being finely shredded, contributes to the texture of Parker’s ’cue. If you prefer, more moisture can be added with the house sauce at the table. Be careful here. It doesn’t take much additional house sauce to light up the ’cue and you as well. The slaw is yellow with lingering hints of mustard but is slightly sweet. This crisp coleslaw has a good, fresh taste and a prominent cabbage flavor. Excerpts from The Best Tar Heel Barbecue Manteo to Murphy pages 272-273.